I cook. I bake. I eat. Chinese New Year: Almond cookies, with crunch! Passionfruit yogurt cheesecake & the winner of the CSN giveaway! New York: Momofuku vs Ippudo - pork buns and ramen galore! My friends often ask me how I find the time to cook dinner as often as I do. The usual reaction is “but cooking is so tedious, how can you do it after a long day at work?”. Well – I do two things. One: I cook in bulk. And when I say bulk, I mean bulk. There are only two of us at home, but I usually cook for at least 4. Occasionally I cook for 6 – I kid you not! This habit originally stemmed from my inability to estimate quantities… and then I realised it was a good thing. Sort of. And number two: I cook simple food. By this, I mean food that takes no more than an hour from start to finish. I reserve the more complex meals for the weekend (in fact, I try to cook something new every weekend), but weekdays are for simple and fast meals. 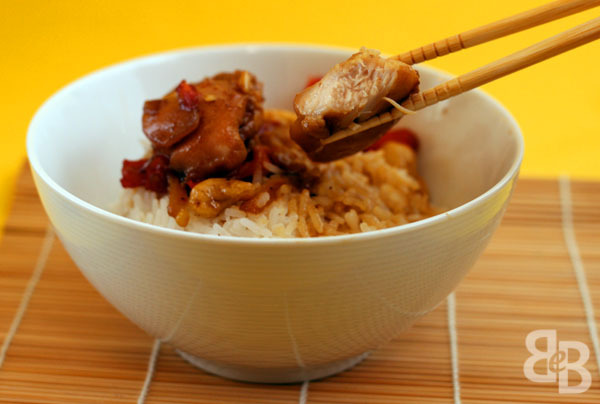 This caramel chicken dish is one of those simple and fast meals. Inspired by none other than the oh-so-smiley Bill Granger (who has fast become one of my favourite chefs), this dish is easy to whip up and keeps well in the refrigerator. As always, I tweaked the recipe. Bill’s recipe calls for chicken, onions and garlic. I added peppers and cashews so I could make it a one-pot meal (plus rice). Bill also browns his chicken at the start of the cooking process, then removes it whilst he cooks everything else. I cooked everything in one go – the main reason for this being I didn’t want to wash an extra bowl. It’s terrible that I have such an inherent inability to follow recipes. Anyway. This dish turned out well, and I really enjoyed the sticky and slightly sweet sauce that coated each piece of chicken. 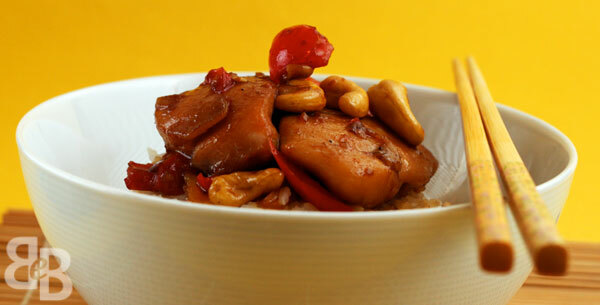 Despite the word “caramel”, this dish is not overly sweet so don’t get too worried! The cashews and the peppers added a nice crunch to the dish – I’m a huge fan of multiple textures in dishes. If you choose to not use cashews/peppers, serve the chicken with a side of vegetables and it should work equally well. 2. Add the chicken, and cook for 3-4 minutes or until lightly browned. You’re aiming for half cooked chicken at this point. 3. Add the peppers, and fry for 1-2 minutes. 4. Add the kicap manis, fish sauce, brown sugar and pepper to the pan. Stir to ensure all the ingredients are covered in the sauce. 5. Lastly, add the cashews and fry for 1-2 minutes. At this point, your sauce should be rich, dark and syrupy. *optional: To make the chicken tender (think Chinese restaurants), add 1 teaspoon of baking soda to the uncooked chicken. Leave for 2-3 minutes, then wash off. I know washing raw meat may cause some of you to gasp in horror, but if you’re careful and confine it all to the sink – it’s not all that bad. But as I said, it’s optional. Hmmm..looks yummy. Agree with u 101%= nothing wrong with leftovers!!!! Thanks! And yes, nothing wrong with leftovers at all! Thanks Lorraine. I owe it all to Bill, all his recipes have worked well for me. 🙂 Love that man. Love leftovers, they are alwys so much tastier! Simple food is the best! I bring leftovers for lunch very often as well, like you I prefer them to sandwiches! Nothing like some warm food for lunch, especially when it’s cold. This looks really delicious. There’s a similar recipe I found in Food & Wine, it was by Charles Phan of Slanted Door fame, but it was not nearly as pretty as yours. It lacked bell pepper and onion, and I think that these make making dinner simpler, more of a ‘one dish’ meal. I like making ‘simple food’ for dinner too. More time + room for dessert. That’s pure brilliance – “more time and room for dessert”. Love it! I’m glad you like my version of this recipe, and how it’s all very ‘one dish’. This is my type of chicken dish! Looks totally mouthwatering! It was very good I must say! I never tire of simple stir fry’s like this. wow this looked truly awesome. like your dish! Norman Musa is too far away, lol. I haven’t been to Manchester in ages I must say. But as I said, if you ever find yourself in London let me know. We’ll definitely have to go “makan” in Ottolenghi! Is there a substitute for kicap manis? Hi Jen, there is. I’ve emailed you, but will also reply here. A good substitute for kicap manis is dark soya sauce. Just add some brown sugar to the dark soya sauce, and it will be similar to kicap manis. In the case of this recipe, I’d probably use about 1-2 tablespoons of brown sugar for 1/3 cup of kicap manis. Su-yin, I LOL’d at your first and second paragraphs! It’s so me, too! Definitely can recall your meatballs. Remember I told you about my habit to cook in bulk, too? Haha! Plus, I still have the inability to estimate accurately too. HAHA! Yeap, for busy folks like us, bulk cooking and baking is a great saver for us! I appreciate leftovers, too! I think this is sorta an East-meets-West dish, eh? 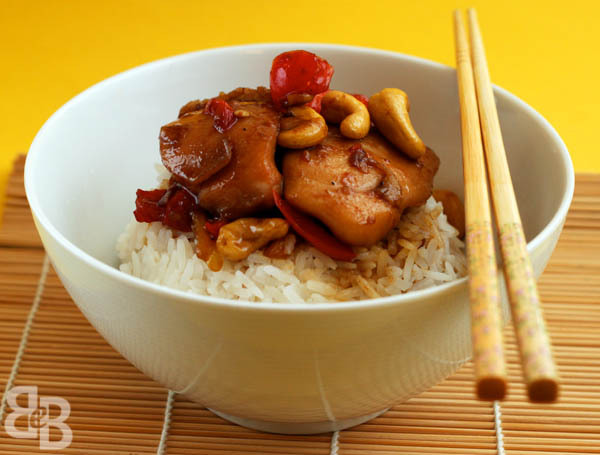 Your addition of cashews and capsicums reminds me of Gong Bao chicken! The capsicums must have added a nice peppery tone to it! Love the crunch of cashews, too! For a lazy bone like me, I love the idea of one-pot meal! Haha! Kung Pao chicken! Definitely wasn’t thinking of that when I made this, hehe. Glad you like the idea of it though. So wish we were neighbors-this sounds so good. I love how you mess with the recipes!